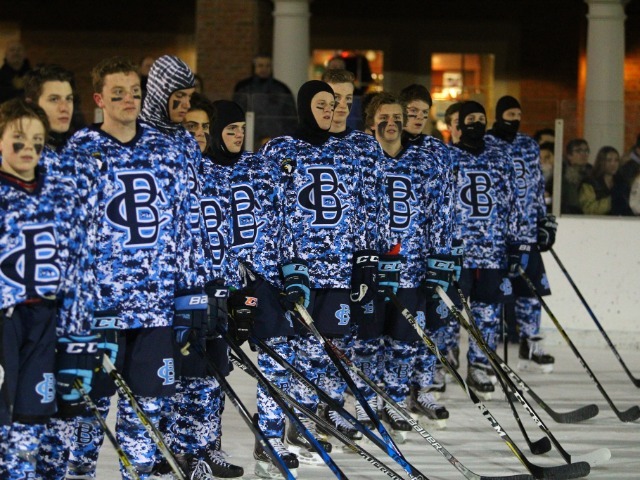 For the second time in three years, the Christian Brothers Academy hockey team hosted the Military Appreciation Game on Wednesday night to benefit veterans in need. Held this time outdoors at the beautiful Navesink Country Club, the Colts welcomed area rival St. John Vianney to play the special game. With help from the Lt. Dennis Zilinski II Fund, CBA's goal was to raise thousands of dollars to help fund a service dog for a veteran suffering from physical or mental trauma, especially those dealing with post-trauma stress disorder (PTSD). All proceeds from ticket sales will go directly towards that goal. CBA also sold commemorative t-shirts and held a 50/50 raffle to help raise money. The Colts received some assistance from past hockey players as well. The three former CBA skaters now playing in the National Hockey League, James van Riemsdyk (Toronto Maple Leafs), Trevor van Riemsdyk (Carolina Hurricanes) and Joakie Ryan (San Jose Sharks), each donated a signed jersey of theirs to be raffled off. Throughout the evening, the game paid tribute to veterans who were either alumni of CBA and SJV or family members of current players. CBA's fundraising partner, the Zilinski Fund, was created in memory of Dennis Zilinski II, a 2000 graduate of the Academy, who was killed in action in 2005 while serving in the Army. The ceremonial puck drop was conducted by CBA's Matthew Zilinski '02, captain in the New Jersey Army National Guard and brother of Dennis, and SJV's Sergeant Tacopino '03, a member of the Marine Reserves. While the funds raised from the evening are still being counted, CBA hopes that, with the help of the Zilinski Fund, a service dog can be purchased for a brave veteran. In 2016, CBA succeeded in that goal and a dog was presented to Air Force veteran Michael Duncan. Duncan visited CBA back in September with his dog, appropriately named Colt, and credited Colt with helping save his life. Duncan and Colt attended Wednesday's game and were honored during the first intermission. Christian Brothers Academy thanks all those who supported this great cause.